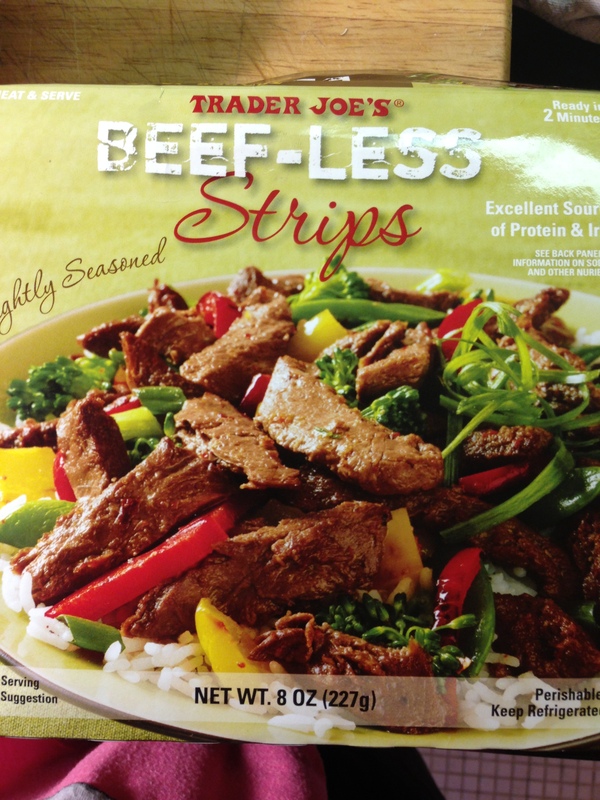 OK – I am officially obsessed with Trader Joe’s Beef-Less Strips. 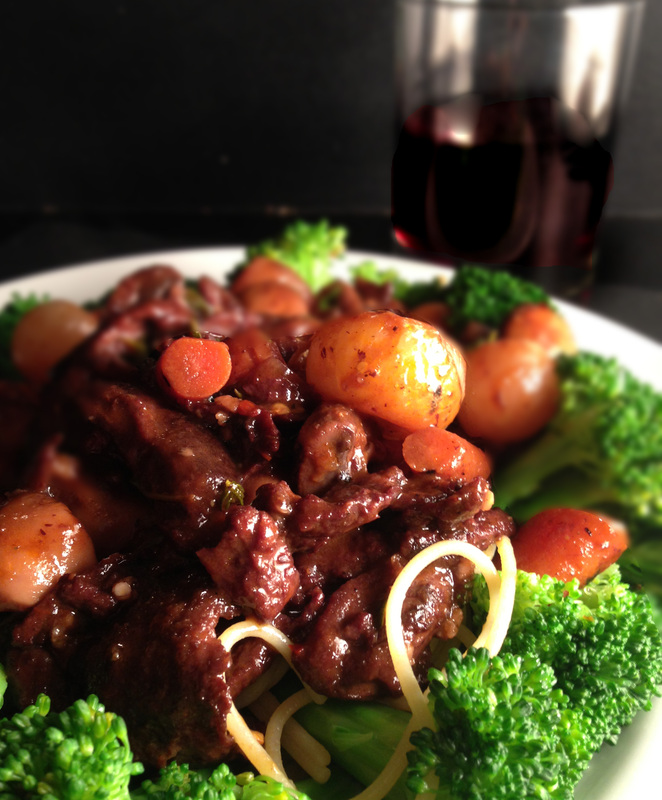 The other day I made the easiest & most awesome Spicy Vegan Mongolian Beef. 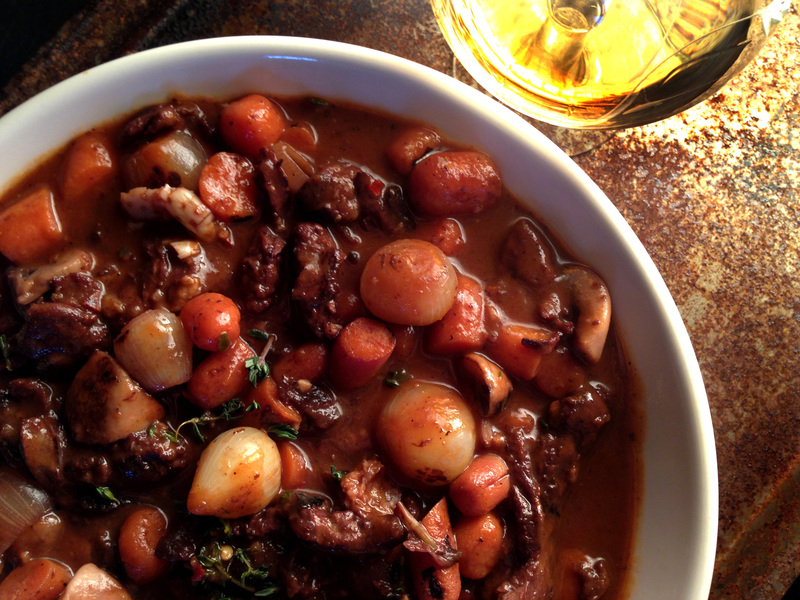 Last night I made this vegan variation of beef bourguignon & it was amazing! 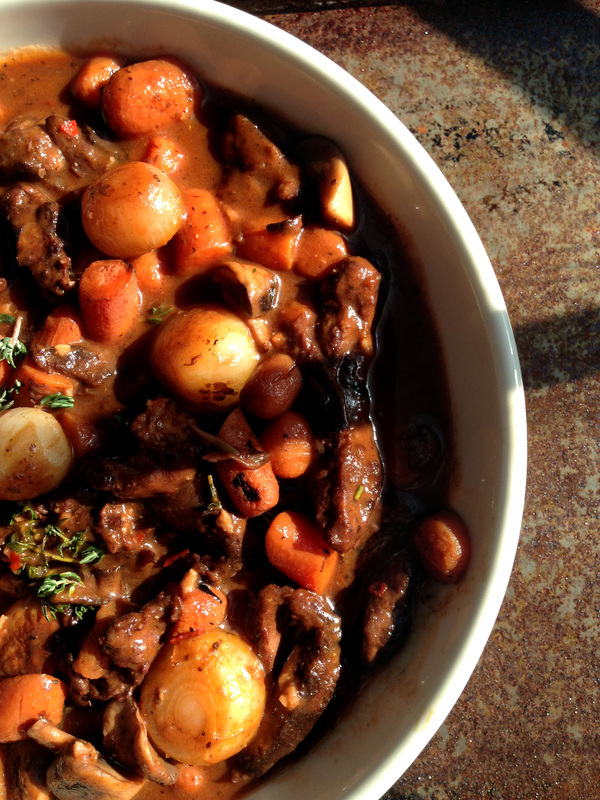 Beef bourguignon is, basically, a French beef stew. 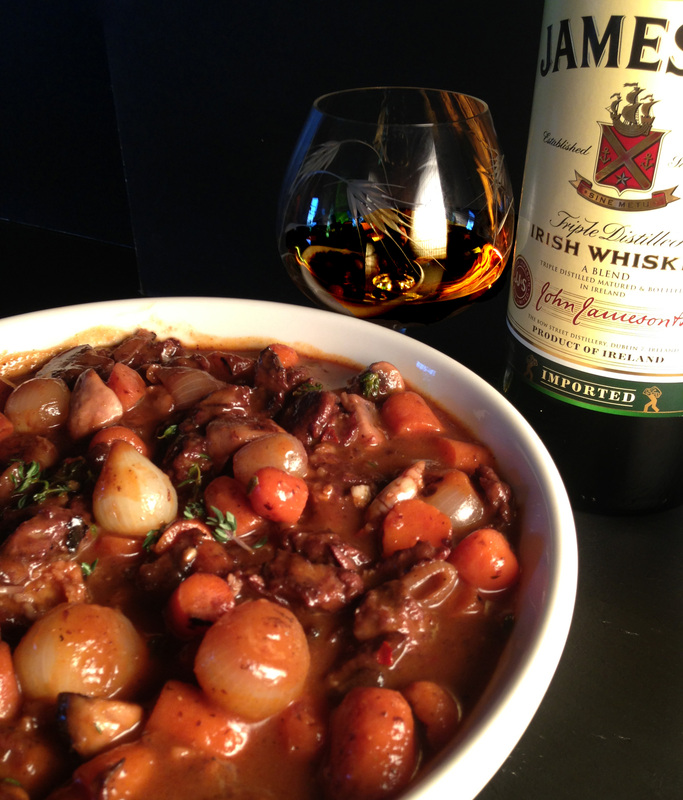 Many recipes call for cognac. 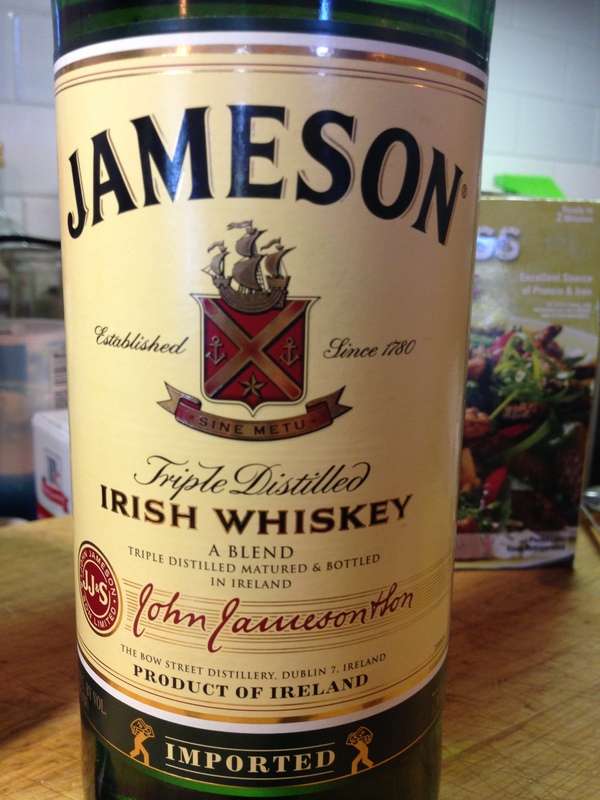 I didn’t have cognac so I used Jameson whiskey. 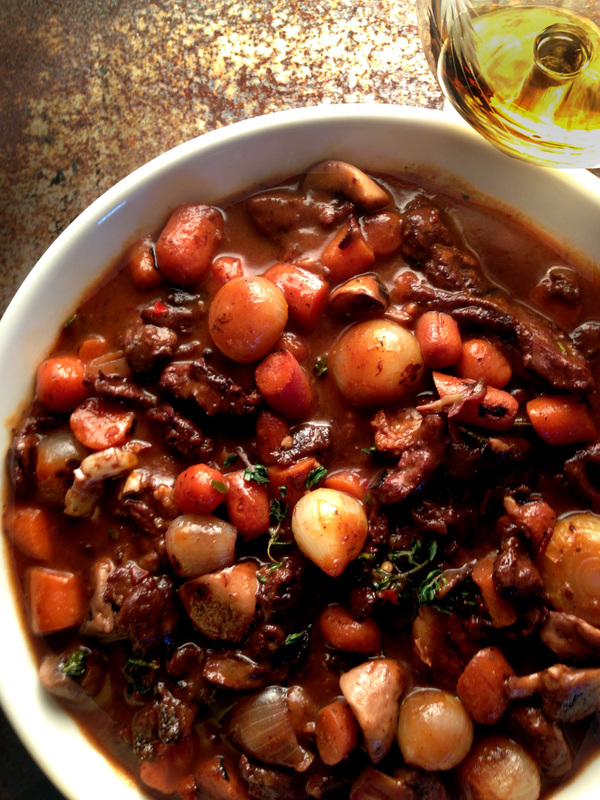 Many beef bourguignon recipes require a good 3-4 hours of cooking the meat in the oven. 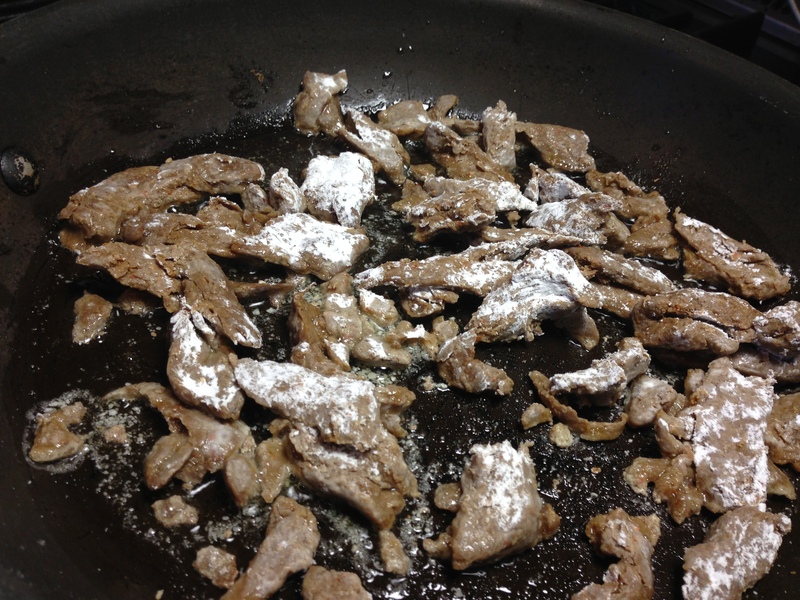 This was made stove top in thirty minutes & I believe that would hold true even if you used real meat. It was so Goddamn delicious – I ate it all – by myself! 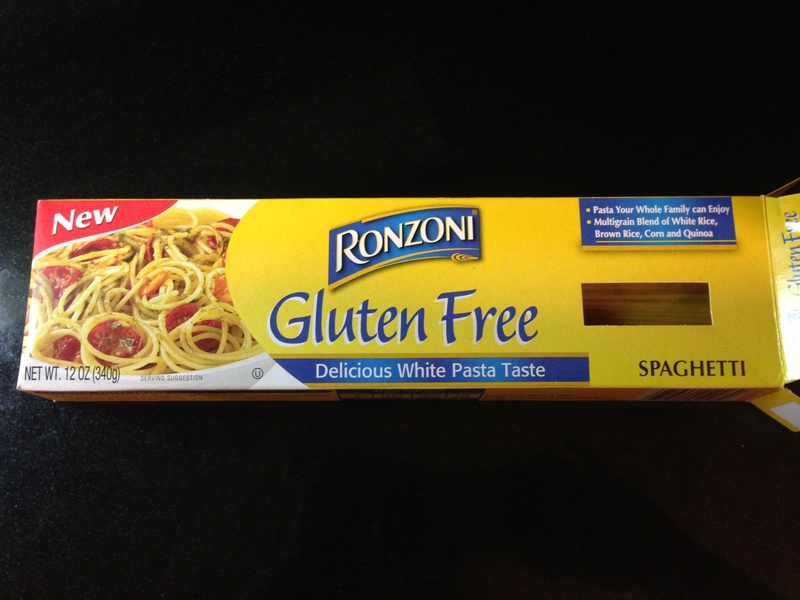 I served it atop gluten-free spaghetti. You could use any pasta you like or mashed potatoes or polenta – whatever. 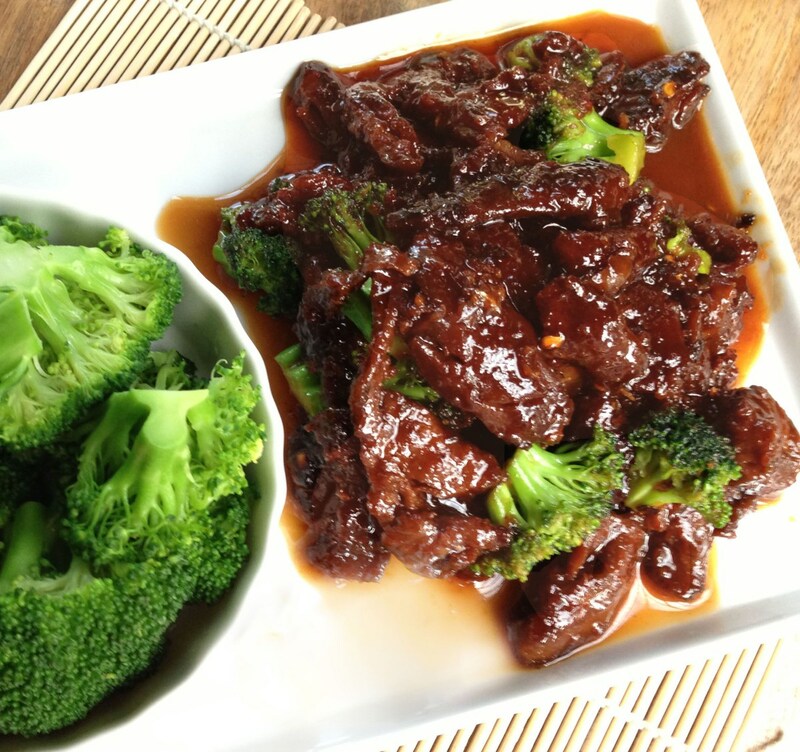 I also steamed some broccoli & added it to the plate. It was really quite something & I sincerely hope you try it. 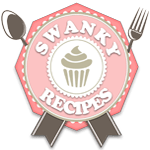 It is SO EASY & so yummy – I promise – you will make it again. If using fresh pearl onions – put them in boiling water for 3 minutes & then drain under cold water. Cut the ends off & peel. Set aside. 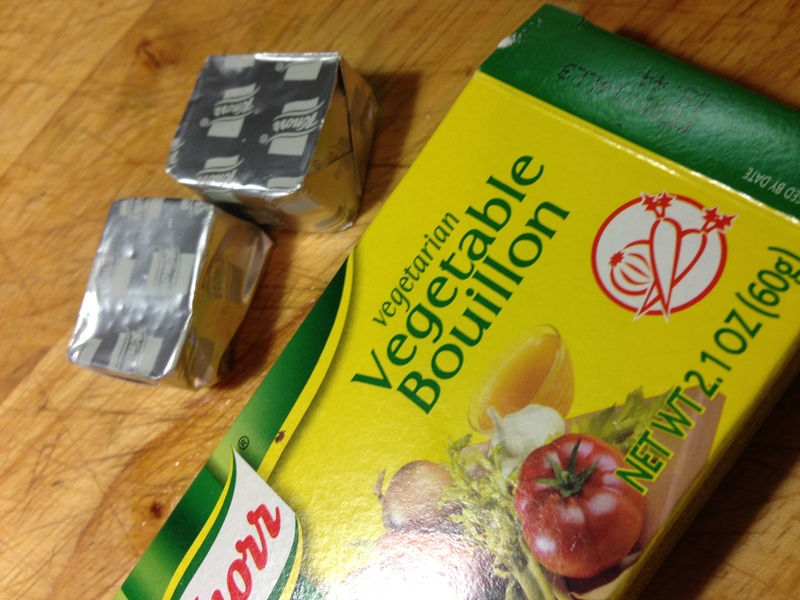 If using frozen ones – jump ahead. 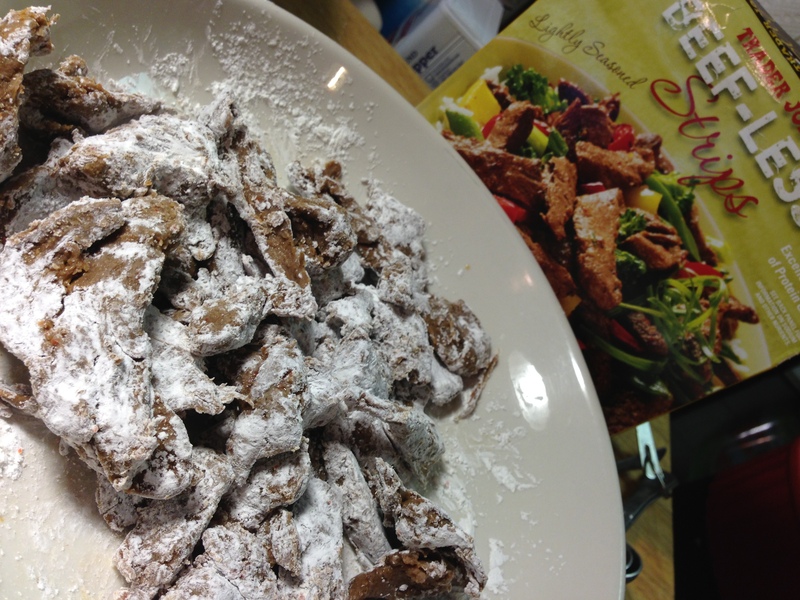 Dredge your meat (real or vegan) in the cornstarch. Put a thin layer of olive oil in a large saute pan & heat over high. Add the meat & sear on all sides. 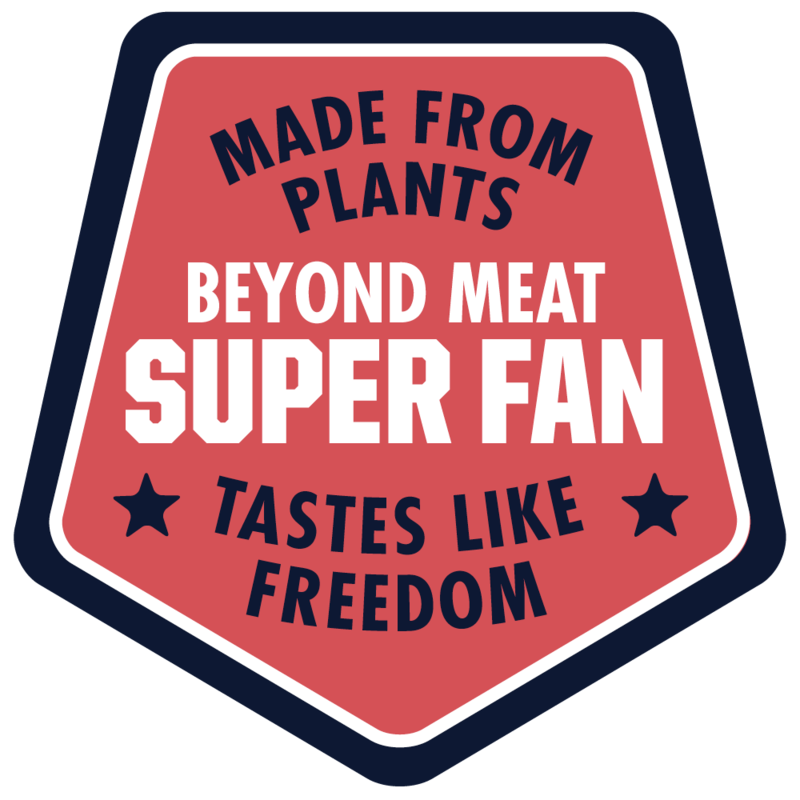 This will likely take longer if you use real meat. 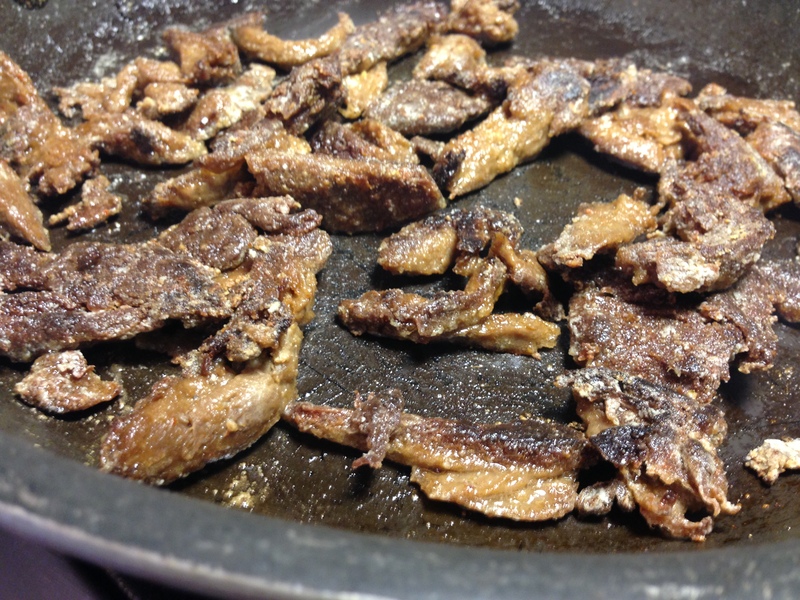 Don’t worry much about under-cooking real meat as it will continue to cook as you add ingredients. 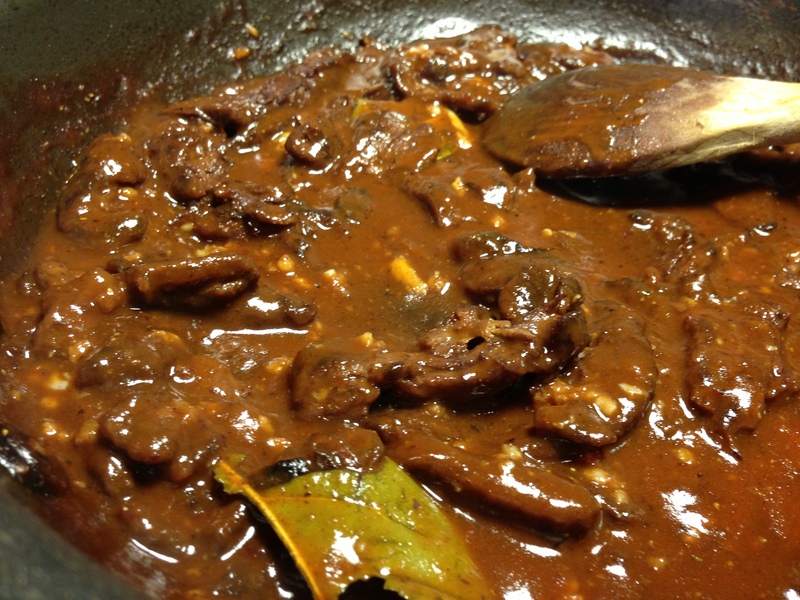 Deglaze the pan with the Jameson whiskey (simply by adding it & stirring it in – scraping the bottom of the pan) & then add 1 cup red wine, the vegetable stock, tomato paste, bay leaves, garlic and crushed red pepper (if using). Heat to a boil then reduce to med-low. Add S&P to taste. Ad several sprigs of chopped fresh thyme (leaves only – not stems). 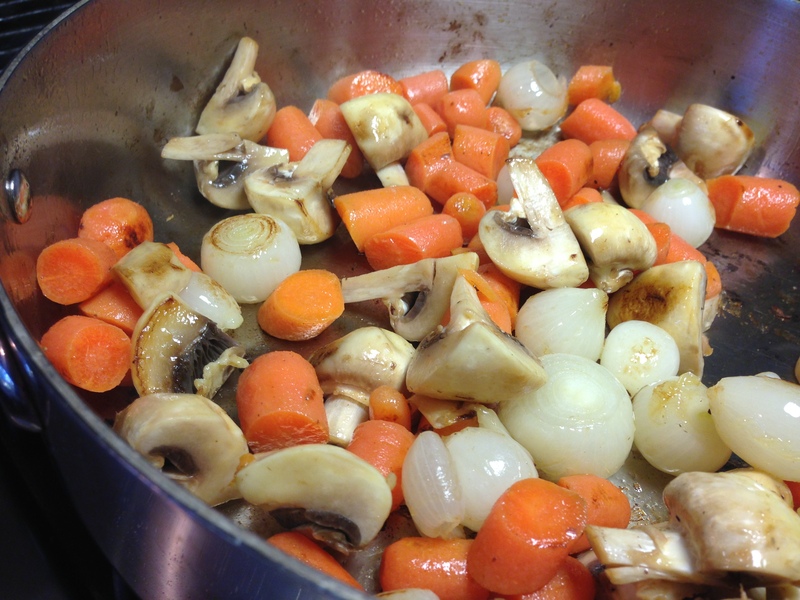 In another pan, add a glug or two of olive oil & over medium heat, saute the pearl onions, mushrooms & carrots. Saute, stirring frequently, until they begin to sear or brown a bit (5 minutes or so). 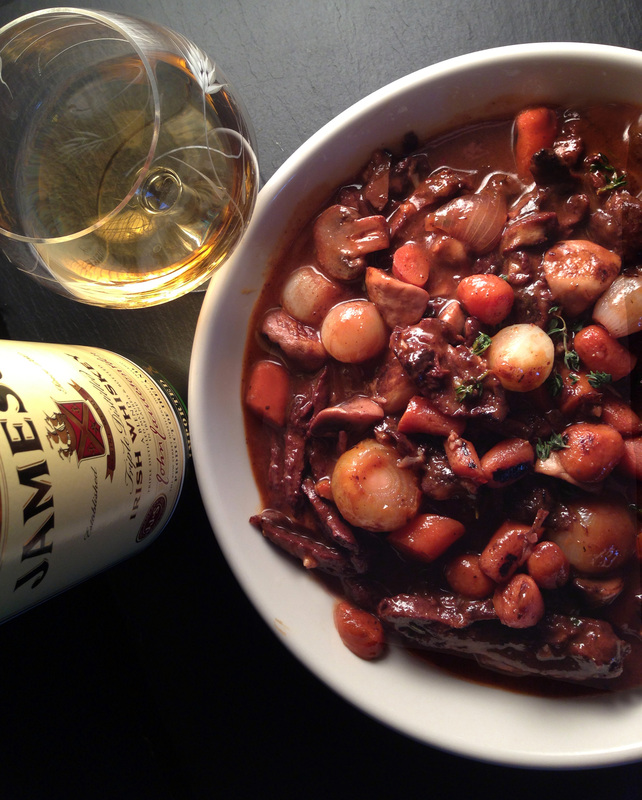 Deglaze the pan with either more Jameson whiskey or wine (or water) and then add the lot to the beef stew pan. Continue cooking over medium heat until the carrots are tender. 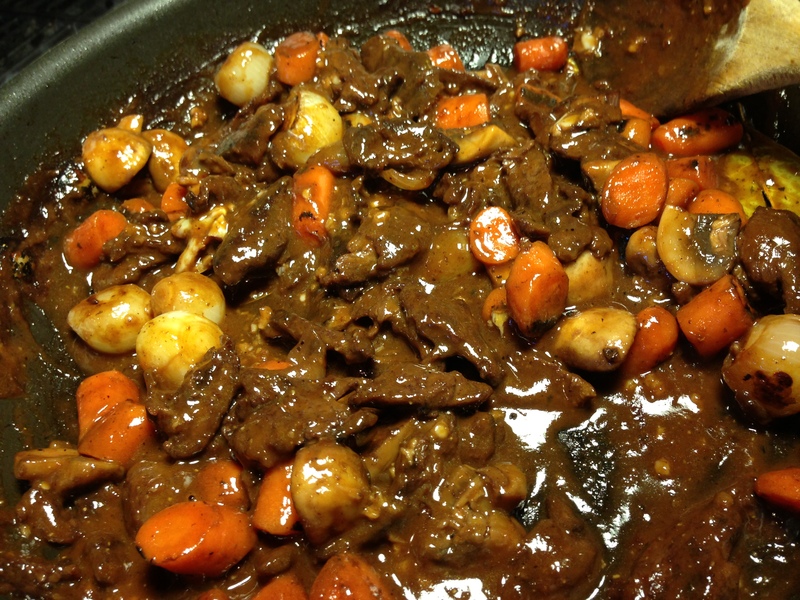 If the stew is too thick, add some water. 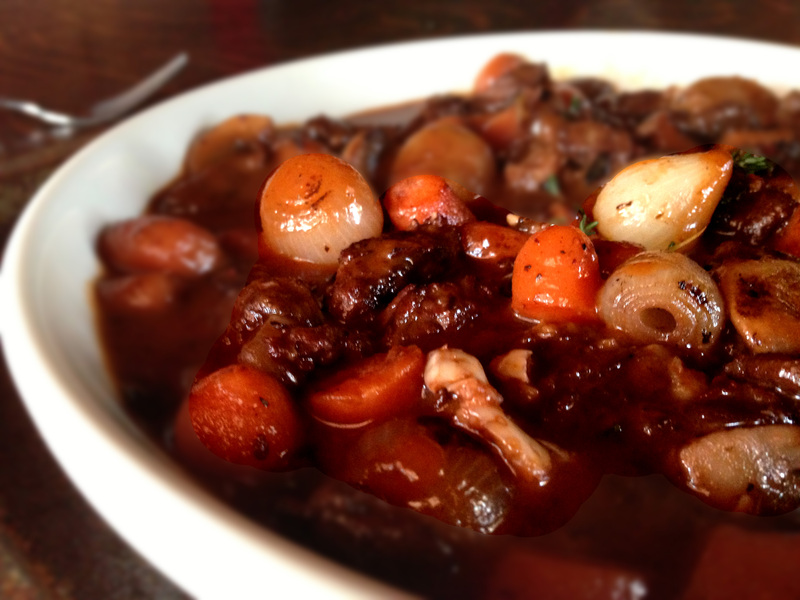 If it is too thin – increase heat & cook until you get the desired consistency. 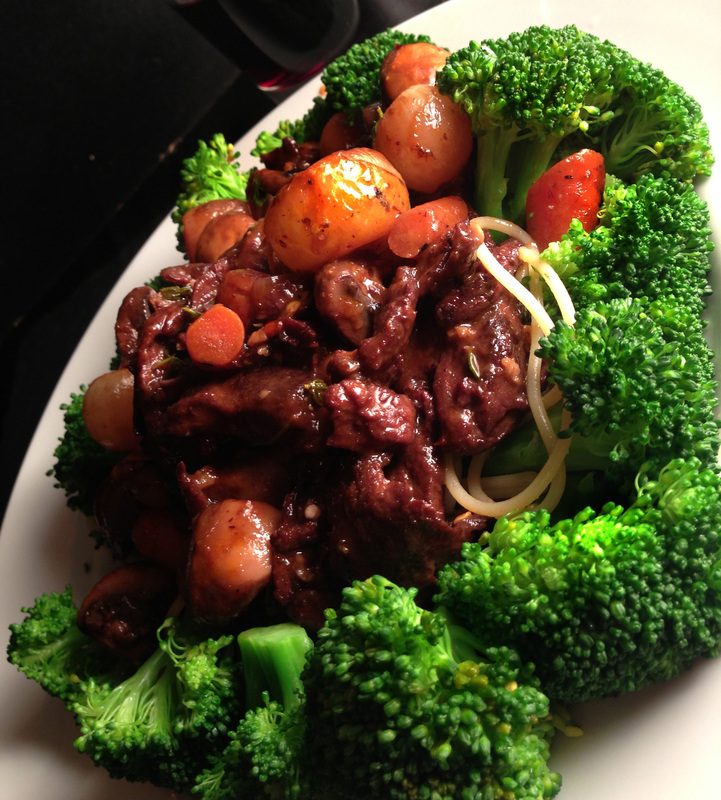 Lower heat & let it simmer while you cook the pasta & steam the broccoli. 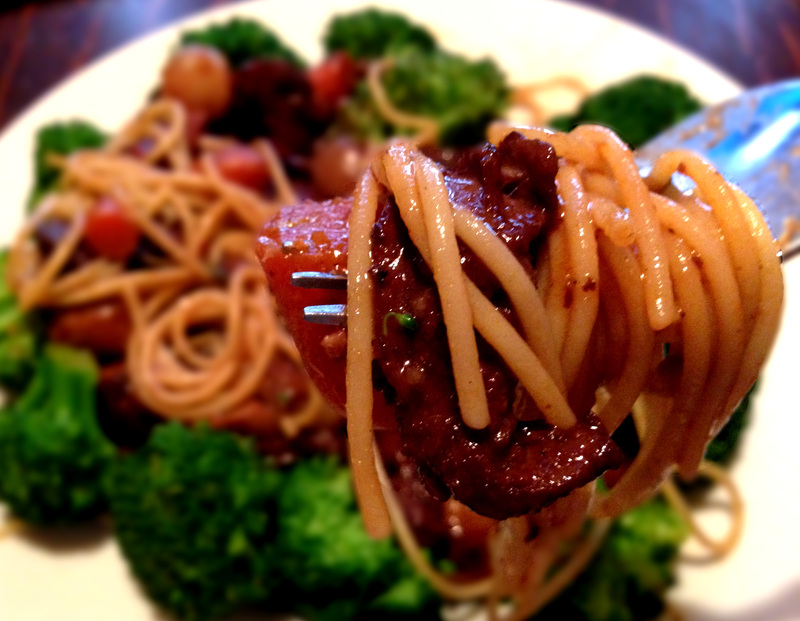 I simply added the broccoli florets to the pasta for the final two minutes. Remove the bay leaves.